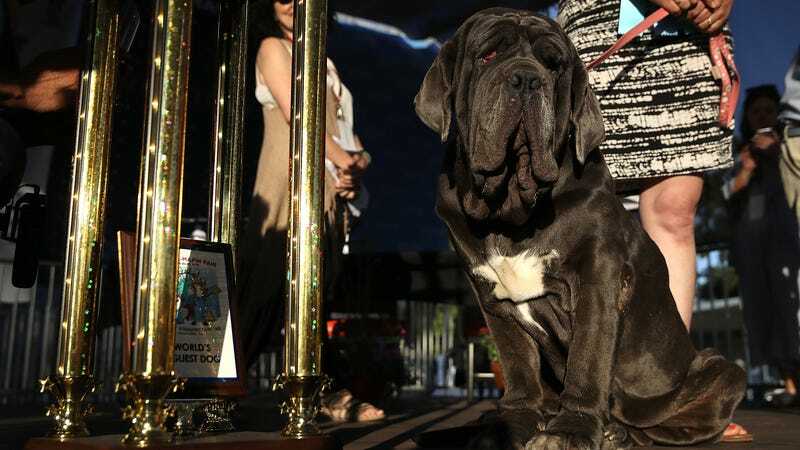 On Friday, the Sonoma-Marin Fair held its annual World’s Ugliest Dog contest, crowning Martha, a three-year-old Neopolitan mastiff, the ugliest dog in the entire world. This prize usually goes to dogs of the smaller, more hairless variety—last year’s winner was a Chinese Crested dog named SweePee Rambo who wore a diaper and was pretty over everything. This year, reports KRON-4, Martha took the cake. Martha’s blind in one eye, gassy, lazy, and snores so loudly that according to the New York Times, her owner forbids her from sleeping in the same room as her. But Martha isn’t actually that ugly, especially when compared to her competitors. Many of these animals are ugly. Many of these animals have unfortunate haircuts and bad dental work. Most of these animals are uglier than Martha. Consider this little creature, who I’m sure has a lovely personality. That dog—again, I’m sure he or she is very nice—is actually ugly. Martha is flatulent, blind, and has cheek folds that could smuggle an entire bag of Clementine oranges, but she’s not ugly. Martha’s eyes might be bright red and her owners might have to clean in between her jowls with a Q-tip to prevent mold and yeast infections and whatever, but that doesn’t mean she’s ugly! Her eyes both face the same way and her tongue stays in her mouth. Also her fur looks like it might smell, but is probably soft to the touch. She’s not that ugly! She’s fine. Martha, you’re not ugly. You do not deserve this prize!! !